Entering Week 5 of the season, eight teams remain unbeaten in Eight-Man, Division I. Among the unbeaten is defending champion Osborne. The Bulldogs have built an impressive resume that includes wins in consecutive weeks against the top-ranked team in Eight-Man, Division II. Challenges still await the Bulldogs, including top-ranked Hanover in district play. The Wildcats have made the jump to Division I behind an experienced group that advanced to the state semifinals in Division II a season ago. Other unbeaten on the east side of the bracket include Udall, Waverly, and Peabody-Burns. On the western half, District 7 includes last year’s state runner-up Hodgeman County and Spearville. Both the Longhorns and the Lancers have been impressive early on. Spearville caught the eye of the state after a 32-28 win over Madison in Week 1. The most exciting offense in the division may reside in Claflin where the combination of quarterback Braedan Crites and wide receiver Layne Bieberle lead unbeaten Central Plains. The Oilers have outscored their last three opponents 194-0. Waverly (4-0) – The Bulldogs’ first three wins were against teams with a 2-10 record. However, Waverly is coming off a 58-32 win over previously undefeated Burlingame. Garrett Myers rushed for almost 200 yards in the win against Burlingame. Marais des Cygnes Valley (2-2) – The Trojans are coming off a 42-33 loss to previously winless Hartford. However, Hartford’s losses came Burlingame, Waverly and Madison – three teams that combine for a 10-2 record. Uniontown (2-2) – The Eagles’ two losses are to two of the state’s top 8-man football teams in Madison and Chetopa. Uniontown fell 48-22 to 8-Man Division I’s fifth-ranked Madison Bulldogs and 56-8 to 8-Man Division II’s top-ranked Chetopa Green Hornets. Marmaton Valley (1-3) – After starting the season 0-3, the Wildcats got their first win of the season by crushing Altoona-Midway 85-7. Marmaton Valley had previously been shut out twice this season. Pleasanton (1-3) – Like Marmaton Valley, Pleasanton’s only win came against Altoona-Midway. The Blu-Jays defeated Altoona-Midway 76-0 in Week 2. St. Paul (1-3) – The Indians’ only win came by a forfeit from Altoona-Midway. This past week, St. Paul played within four points of Colony-Crest. The Indians are in their first season with head coach Keith Wiatrak, who took over for longtime coach Doug Tuck. Udall (4-0) – The Eagles sit just outside the state rankings. Udall edged Caldwell 14-12 in Week 2 and have rolled in its other three games. Junior Dalton Loos leads Udall in rushing with about 500 yards and 11 touchdowns. Oxford (3-1) – The Wildcats have earned wins over South Haven, South Barber and Flinthills. However, Oxford lost 54-6 to Udall in a non-district game. The two teams will meet again in the final week of district competition. Sedan (3-1) – Sedan’s only loss came 44-38 to South Haven. The Blue Devils are led by senior quarterback Tyler Holt, who has passed for more than 600 yards and has rushed for more than 500. West Elk (3-1) – West Elk’s only loss of the season was to Caldwell. In their other three games, the Patriots have defeated St. Paul, Bishop Seabury and Lebo. Junior Armando Gomez leads the Patriots with almost 600 yards rushing. Cedar Vale-Dexter (2-2) – The Spartans’ two losses are to teams – Argonia-Attica and Caldwell -- that combine for a 7-1 record. They defeated South Haven 40-6. Central Burden (2-2) – Like Cedar Vale-Dexter, the Raiders’ only losses were to Argonia-Attica and Caldwell. Central Burden fell 8-6 to Caldwell in the season opener. Peabody-Burns (4-0) – The Warriors have started strong with wins over Goessel, Canton-Galva, Little River and Solomon. Quarterback Braxton Kyle has passed for more than 400 yards, while rushing for more than 300. Junior Clayton Philpott leads the team in rushing with 489 yards. Burlingame (3-1) – The Bearcats started their season 3-0 before falling to undefeated Waverly this past week. Junior Robert Hutchins leads the Bearcats with more than 500 yards rushing. Quarterback Jake Carlson has passed for 259 yards and rushed for more than 400. Madison (3-1) – The fifth-ranked Bulldogs fell 32-28 in the season opener to fourth-ranked Spearville. Since then, Madison has cruised to wins over Uniontown, Hartford and Southern Coffey Co. Owen Reed rushed for 228 yards and six touchdowns in the win against Southern Coffey County. Once again, the Bulldogs are a little beat-up entering district play. Their health will be a factor in this district and in the playoff picture. Rural Vista (3-1) – The Heat is on a three-game winning streak since falling 46-22 in the season-opener against Little River. Rural Vista has defeated Goessel, Solomon and Centre-Lost Spring. Those three teams combine for a 3-9 record. Flinthills (1-3) – The Mustangs’ only victory was against winless Elk Valley. Flinthills has scored only eight points in the other three games combined. Lebo (1-3) – The Wolves have allowed 48 points or more in each of their three losses. Their only win was 58-14 against Southern Coffey County. Key games: All teams with the exception of Flinthills have a chance to make some noise in this district. The Week 6 Madison at Peabody-Burns game may ultimately decide both spots. Osborne (4-0, 2-0 district) – The Bulldogs have continued their dominance after winning the 8-Man I championship game last season. Junior quarterback Jake Tiernan and senior tight end Brandt Wolters are two of 8-Man's best players, while transfers Richard Zeiters and Matt Pfannenstiel have bolstered a team that lost several key players to graduation. The Bulldogs have played a tough early season schedule with solid victories over 8-Man II powers Thunder Ridge and Beloit St. John's-Tipton. Osborne has won 17 straight games and scored at least 40 points in each of them. Hanover (4-0, 1-0 district) – The Wildcats have smoothly transitioned to 8-Man I this season rolling up 214 points in their first four wins. Hanover entered the season with nine players with starting experience from last year's 8-3 team that lost only to eventual state champion Baileyville B&B (twice) and eventual state runner-up Sharon Springs-Wallace County. Hanover looked impressive in a 52-6 district win over Wakefield in Week 3 after the Bombers had scored 96 points the week prior. Lincoln (3-1, 1-1 district) – The Leopards opened the season with an impressive three wins in which they scored at least 50 points in each game and allowed only 40. But last week, the Leopards fell 56-8 to Osborne in their first real test. Junior quarterback Zac Walter is among the state's leaders in rushing with 752 yards and 14 touchdowns through four games. Wakefield (3-1, 1-1 district) – The Bombers appeared poised to make a playoff run after a 2-0 start that included a 96-point outburst against Solomon. In that game, junior running back Zack Melius score 11 total touchdowns. After last week’s 52-6 loss to Hanover, the Bombers are likely fighting for their playoff lives. Keenan Westerman is a four year starter at quarterback for coach Chris Freeman. 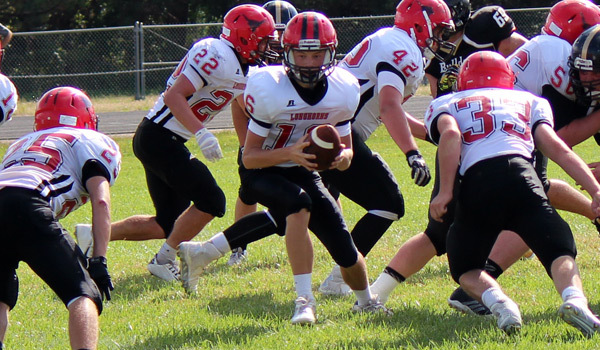 Clifton-Clyde (1-3, 1-1 district) – Perennial power Clifton-Clyde posted their first win last week against Lakeside-Downs and look to be in the middle of a rebuilding year. With only two starters back, coach Russ Steinbrock knows his team will need to grow up quick, but a deep district will likely present several challenges along the way. Lakeside-Downs (3-1, 0-1 district) – The Knights broke a 14-game losing streak in Week 1 and opened the season 3-0. Lakeside scored at least 36 points in each of its first three games before dropping a 40-6 contest in their district opener with Clifton-Clyde. First year head coach Drew Duskie relies on senior quarterback Shayne Renken, in his second year as a starter. Mankato-Rock Hills (2-2, 0-2 district) – Rock Hills opened with two victories before dropping two district games by big margins. Senior Joel Broeckelman is one of the fastest players in Kansas and has moved under center this fall after missing most of last season due to injury. Broeckelman has rushed for 485 yards with 11 TDs, including 212 yards on 24 carries last week. Key games: (Wk 9) Osborne at Hanover will likely decide both playoff spots. Central Plains (4-0) – The Oilers have one of the most explosive passing offenses in 8-Man football led by junior quarterback Braedan Crites and senior wideout Layne Bieberle. Central Plains has scored at least 42 points in each of their four wins this season. The defense has been strong in pitching three shutouts after allowing 24 points to Victoria in Week 1. Canton-Galva (3-1) – The Eagles’ three wins have come against a Burrton team that is in the midst of a 27-game losing streak and two non-KSHSAA schools. In their only test of the season, the Eagles lost 56-20 to unbeaten Peabody-Burns. Jeff Savage teams are known for offense and this year’s team appears to fit that mold scoring at least 50 points in the three wins. Ellinwood (2-2) – New to the 8-Man ranks, Ellinwood has been competitive in all but one game, a 62-8 loss to Victoria. In the other three contests the Eagles have scored at least 34 points including a 40-20 win over winless St. John and a 56-6 win against winless Macksville. Little River (2-2) – Consistent winner Little River has lost in back-to-back weeks against unbeaten teams in Peabody-Burns and Udall. The Redskin offense is led by speedy senior running back Grant Harvey who has rushed for 345 yards and seven touchdowns through three games. Senior quarterback Cordell Moore has completed 10 of 35 passes for 223 yards with two scores. Goessel (1-3) – The Bluebirds posted their first win last week, 40-32 over Sylvan-Lucas Unified, after dropping a two-point decision to Centre-Lost Springs. The Bluebirds were blasted by Peabody-Burns and Rural Vista by a combined 102-8 to open the year. The Bluebird offense includes four different players who have tallied at least 153 total yards this season. Solomon (1-3) – A young Solomon team has struggled under new head coach Justin Coup. Coup took over the reins of the Gorillas after three successful years as the head coach at Baileyville B&B. Junior quarterback Cain Fowles is talented, but needs better protection from his offensive line. Senior Blake Homman is one of the top tight ends in Kansas, but has been hampered by injuries. Key Games: (Wk 6) Little River at Central Plains will likely decide both playoff spots. Pratt-Skyline (3-1) - Pratt Skyline, looking for its first playoff berth in 15 years, opened 3-0, including a big win against South Barber in Week 1. Senior Dustin Weber has 104 carries for 798 yards and nine scores, and senior Daniel Hacker has 43 carries for 278 yards and seven TDs. The Thunderbirds lost 90-52 to undefeated Argonia-Attica last week. South Central (2-2) - South Central, which made the playoffs last season behind all-state quarterback Stetson Underwood, has started 2-2 this year with a different signal caller. The T-Wolves defeated Ashland 52-6, lost to Spearville 54-8 and Satanta 36-24 and then beat Deerfield 46-0 last week. Sophomore Gerald Morehead has taken over at quarterback and has a 0/4 TD/INT ratio, but leads the team with 90 carries for 475 yards and nine scores. Kinsley (1-3) - The Coyotes lost the highest scoring game in eight-man state history, 104-70, to Otis-Bison last week. The Coyotes haven’t made the playoffs since a stretch of four straight from 1990-93. Kinsley’s three losses have come against Ness City, Central Plains and Otis-Bison, teams that are a combined 9-3. Kiowa County (1-3) - Kiowa County has fallen back after graduating all-state standout quarterback/defensive back Trever Powell from a 10-1 team. The Mavericks have two blowout losses, a 44-36 defeat to Minneola in Week 2, and a 50-34 victory against Ashland in Week 3. Macksville (0-4) - Up until two seasons ago, Macksville had the second-longest current eight-man playoff streak behind Victoria. But the Mustangs have fallen on hard times after a 10-1 season in 2012 and a 4-5 mark last year. Opponents have outscored Macksville 248-12. St. John (0-4) - St. John has also taken a tumble from an 8-2 season in 2012. The Tigers have been outscored 190-64 and have now lost eight straight games dating back to a 56-20 victory against Kinsley on Oct. 4, 2013. Key Games: (Wk 5) South Central at Kiowa County should go a long way in deciding the second playoff spot. Hodgeman County (4-0) — The Longhorns, which stayed under the radar en route to a state runner-up showing in 2013, has started 4-0 this season behind a balanced offense. Freshman Jacob Salmans has completed 39 of 54 passes for 757 yards with 10 scores against one interception. Senior Kolt Washburn and Will Crabill have combined for 22 rushing scores. Spearville (4-0) — The Lancers, ranked No. 4 in Eight-Man, Division I, have four players who have rushed between 182 and 281 yards. Seven players have scored a rushing TD. Junior quarterback Nathan Stein has 235 rushing yards and five rushing scores, and has also completed 16 of 34 passes for 272 yards with four scores against no interceptions. Spearville has one turnover in four games and is plus-three in turnover margin. Ness City (3-1) — The Eagles had a 381-230 yard edge in its 26-22 loss to Victoria last Friday night, but committed five turnovers and gave up several big special teams plays. Quarterback Tanner McMillen and running backs Pedro Flores and Jacob Hoss pace the offense. Dighton-Healy (2-2) — Dighton, which advanced to the second round of the playoffs last season, is in its first season of a co-op with Healy. Dighton-Healy lost its first two contests, but has defeated Moscow and Greeley County by a combined score of 104-46 the last two games. South Gray (1-3) — The Rebels have three blowout losses sandwiched around a 44-26 victory against Fowler in Week 3. The Rebels are 1-1 at home and 0-2 on the road. WaKeeney-Trego (1-3) — The Golden Eagles are 1-1 at home and 0-2 on the road with the lone victory a 70-56 victory against Stockton in Week 1. Senior Isaiah Fabrizius has passed for 180 yards and rushed for 187. Oberlin-Decatur Co. (3-1, 2-0 district) – Oberlin has adjusted well to the eight-man ranks and stayed with its trademarks of running and defense. Junior Bryson Wesley leads Oberlin with 60 carries for 507 yards and five scores. The Red Devils have averaged 241 rushing yards a contest. Senior Rex Diederich and Wesley each have six TFLs. Atwood-Rawlins Co. (2-2, 1-0 district) - Atwood was 7-2 and 8-2 the last two seasons with no losses before Week 8 in both years. This season, the Buffs fell 24-12 to Sharon Springs-Wallace County in Week 1, and 22-20 to Northern Valley last Friday. Both of those opponents are 4-0 in Eight-Man, Division II. Logan-Palco (3-1, 1-0 district) - The Trojans, with just 18 players, started 3-0 before a 54-28 loss to rival Northern Valley last week. Three players have between 276 and 353 rushing yards. Sophomore Josh Van Laeys has 57 tackles with 15 tackles for loss. Hill City (2-2, 1-1 district) - Hill City is 0-2 at home and 2-0 on the road. Senior quarterback Deric McKeever has 586 rushing yards and four scores and has a 5/3 TD/INT ratio with 211 passing yards. St. Francis (3-1, 1-1 district) - Like Oberlin, St. Francis has played well in its first season of eight-man football. The Indians have already matched its win total from last season and outscored opponents 145-102. The Indians have two wins by a combined 13 points. St. Francis lost 52-34 to Oberlin in Week 3, a game that will likely keep them from the district title – but the Indians are still strongly in contention for the runner-up spot. Quinter (2-2, 0-2 district) - The Bulldogs started 2-0, including a last-second 38-34 Week 2 win against rival Hoxie, but has a big uphill climb with five games left. Quinter suffered a surprise home loss, 40-20, to Hill City in Week 3, and then lost 37-30 to St. Francis last Friday. Senior quarterback Tyler Waggoner has passed for 619 yards and a 13/2 TD/INT ratio, and senior Devantae Goldsby has rushed for 462 yards and scored seven rushing TDs. Stockton (0-4, 0-2 district) – The Tigers have two losses by a combined 26 points, but took a 46-0 loss to Oberlin last week. Stockton hasn’t made the playoffs since 2002. Key Games: (Wk 5) St. Francis at Atwood-Rawlins Co.; (Wk 8) Oberlin at Atwood-Rawlins Co.